When you cut down a tree, a stump is often left behind. A remnant stump can create an eyesore as well as sprouting new trees and creating an obstacle to mow around. One way to remove a stump is to let nature take its course. Over time, a stump will gradually rot away. But if you don’t have time to wait for Mother Nature to do her work, you can speed the process along with an acid. 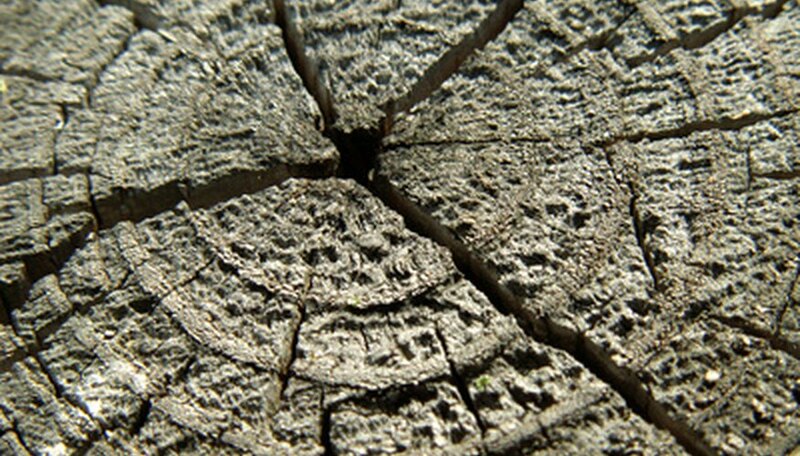 There are several companies that manufacture acids specially formulated to rot away a stump. Wait for the stump to age 1 year. Acid-based stump removers won’t work on new stumps. Cut off as much of the stump sticking out of the ground as possible with a chain saw. Drill 1-inch-wide holes into the perimeter of the stump 4 inches in from the bark. The holes should extend 12 inches into the stump. Use a drill, spade bit and spade bit extension to drill the holes. Drill a second set of holes at a 45-degree angle into the stump from around the bark’s edge. These holes should only go about 4 inches deep into the tree and should connect with the primary holes to help speed the rotting process. Pour 4 ounces of stump remover into each hole. Top off each hole with water. The stump should rot within 4 to 6 weeks.